The spine-tingling suspense of mystery stories and crime thrillers is very popular with young readers today. Here are some of the new releases along with some beloved classics from children’s and young adult fiction. Almost 90 years after its debut, Erich Kästner's Emil and the Detectives made Spiegel’s spring 2018 best seller list in young adult fiction. The story of a child detective has been a perennial favourite for generations, and its inclusion on the list raises the question of what other, more contemporary crime fiction is available for children and teens. In the children’s book category, the list featured Achtung, Dinos! (Warning, dinosaurs!) by von Boris Pfeiffer und Ulf Blanck. a book in the Die Drei ??? Kids (The Three Investigators, Kids) series. This spin-off of the popular Die Drei ??? (The Three Investigators) series written for young children reflects a popular trend, and many crime and detective stories for young people are retakes on or age-appropriate rewrites of popular series of the past that went out of print years or even decades ago. For girls, there is the Drei !!! series featuring three female investigators, while slightly older readers will enjoy the graphic novel Die drei ??? Das Dorf der Teufel (The Three Investigators and the Village of the Damned). A trusted staple on the shelves of young people for decades -- Die drei ??? (The Three Investigators) series has spawned a lot of spins-offs. | Photo: © Kosmos Verlag Some new releases are translations of fantastic mystery series, such as the cases Ulf Nilsson and Gitte Spee's Commissioner Gordon series covers for early readers, and the thrilling mysteries solved by Martin Widmark and Helena Wills' Whodunit Detective Agency. Young adults can delve into the worlds of Alan Bradley's intrepid heroine Flavia de Luce, and Robin Steven's Wells & Wong series with the fourth instalment, Jolly Foul Play, just released in March 2018. German-language books are strong list contenders as well, and Rico and Oskar, Andreas Steinhöfel's award-winning, highly talented investigative duo often regarded as the successors to Kästner's Emil, survive their fourth adventure in Rico, Oskar and Vomhimmelhoch (Rico, Oskar and from Heaven Above). Thabo. 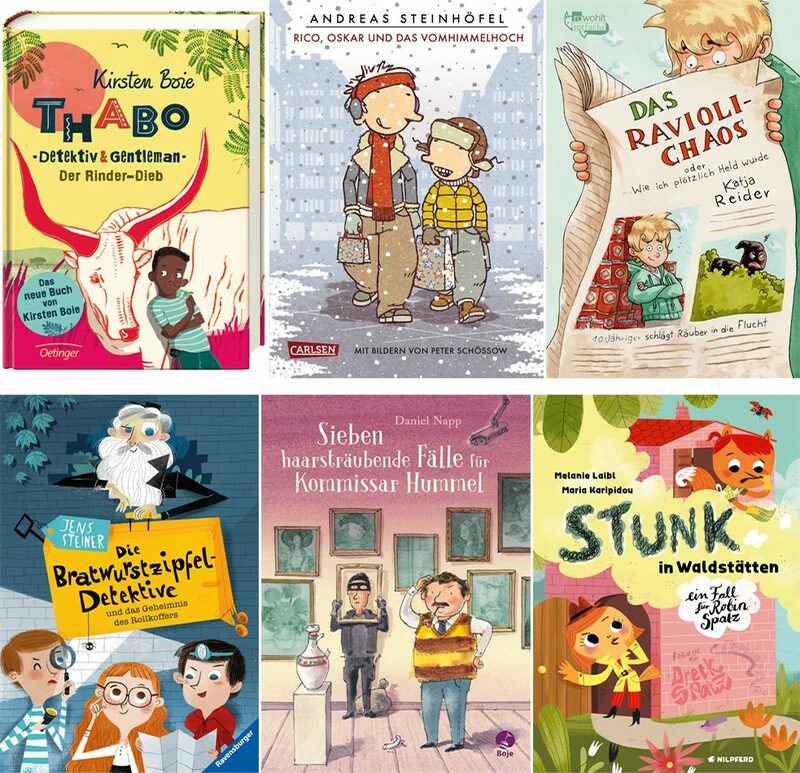 Detektiv und Gentleman is the eponymous detective and gentleman hero of Kirsten Boie's African children's crime series, solved three exciting cases in 2016 and 2017, leaving hope for further detective stories from Swaziland soon – including a radio drama on NDR. In his children's book debut, Die Bratwurstzipfel-Detektive und das Geheimnis des Rollkoffers (The Sausage-End Detective and the Secret of the Trolly Case), Jens Steiner takes a fun, playful take on the typical children’s mystery plot, sending a colourful gang of kids to follow up on clues in secret tunnel system under a city insiders will recognize as Zurich. Daniel Napp, the creator the beloved adventures of Dr. Brumm the bear, takes his readers to the hairdresser to listen in on tales of Sieben haarsträubende Fälle für Kommissar Hummel (Seven Hair-Raising Cases for Commissioner Hummel). Embedded in the solution to a real case involving some stolen cans of hair spray, three siblings are entranced by the yarns by hairdresser and raconteur Pellepau spins. The eccentric hairdresser will only cut a customer’s hair if he can tell them stories in the process, which turn out to be truly hair-raising. The topics covered by children’s and young adult mysteries are varied, running the gamut from hot pursuits of gangsters to pilfered cans of hairspray. | Photo: © Oettinger (Thabo), Carlsen (Rico), Rowohlt rotfuchs (Ravioli), Ravensburger (Bratwurstzipfel), Boje (Kommissar Hummel), Nilpferd (Stunk) The tale told by Katja Reider's ten-year-old first-person narrator in Das Ravioli-Chaos oder Wie ich plötzlich Held wurde (The Ravioli Mix-up or How I Suddenly Became a Hero) takes places in the supermarket. And while what transpires may not be quite enough for a career at the BKA (Bundeskriminalamt or German Federal Office of Criminal Investigation), where Lenni and his best friend Walz recently applied, it is enough for 15-minutes of fame thanks to an unusual approach to helping a criminal escape punishment told with a great deal of humour. Similarly in Fritz Fassbinder's Rocky, die Gangster und ich oder wie Mathe mir das Leben rettete (echt jetzt!) (Rocky, the Gangster and Me, or how math saved my life (honestly! )), two friends investigate in an extremely dicey case – though here one is a retired police dog. Rocky and Felix take turns talking about their encounter with gangsters, a kidnapping, and the fact that math is not always a bad thing. 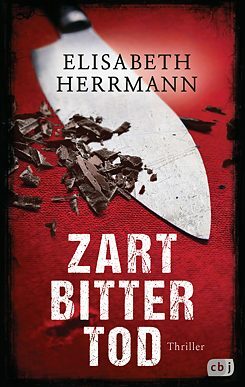 The thriller is increasingly winning over readers in young adult fiction: “Zartbittertod” (Dark Chocolate Death) by Elisabeth Herrmann. | Photo: © cbj While children’s books focus on stories of close friends, funny narration, and, as in the case of Melanie Laibl and Maria Karipidous’ environmental crime thriller for early readers, Stunk in Waldstätten – Ein Fall für Robin Spatz (Something Rotten in Forest Vale – a Case for Robin Redbreast), on animal investigators, young adult fiction can be quite dark at times. And quite thrilling, like when sinister family secrets come to light and a routine research assignment at the journalism school is suddenly a murder investigation with deep political overtones in Elisabeth Herrmann’s Zartbittertod (Dark Chocolate Death). Marlene Zöhrer works as a freelance editor, journalist and reviewer of children’s and young adult literature and lectures at the Chair for Didactics of the German Language and Literature at Ludwig-Maximilians-Universität in Munich. Copyright: Text: Goethe-Institut,Marlene Zöhrer. This work is licensed under a Creative Commons Attribution – Share Alike 3.0 Germany license.